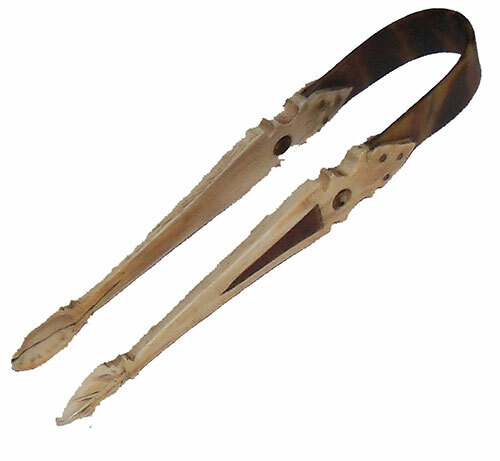 Presented here, Scrimshaw Sugar Tongs made of Tortoiseshell and Whale Ivory. Domestic implements for use at the table were often made by the Whaler as a gift to a loved one at home, usually a wife or mother. These items testified to a husband, son or father away on a long whaling voyage and were treasured by the recipient, serving to remind them of their sailor at sea. Today in many homes such objects are still treasured within the family and passed on from generation to generation, their whaling past evoking a sense of history and appreciation of the skill of the scrimshander. These tongs are beautifully made testifying to the skill of the maker. 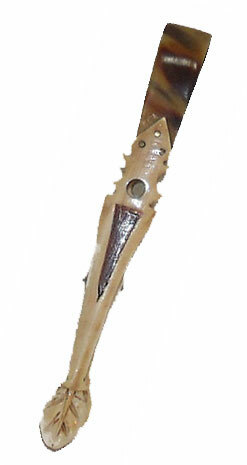 The use of Tortoiseshell in the handle and inlaid into Ivory on the tongs would indicate that this was a very special gift for use in a very fine home. They are elegant as befits a fine table or tea service. 5 inches long, in very fine condition and fully functional. We've never seen another.